Glad you got your contract issue sorted out. I knew there were some old school members on here that were on the old contracts. If I could turn back time, when I did my review, I should have taken a screenshot of the then 12 month deals. Ah well. In respect to the Cellpipe, I have no idea. I don't know off hand any members who have switched providers on the Digital Region network to be honest. Maybe someone here can shed some light on that?. After everything has changed I will post my experience. I have asked ask4 about the cellpipe and they said they need to speak to DR to see if they will want it back. I also asked if they know which cabinet in connected to but they did not know without talking to DR but said my line length was 455m and aluminium but 455m seems pretty long when the nearest cab is just down the road line of sight is estimated at 100m so the only way my line can be this long would be if im connected to a different cab or BT took a big detour laying the cable. 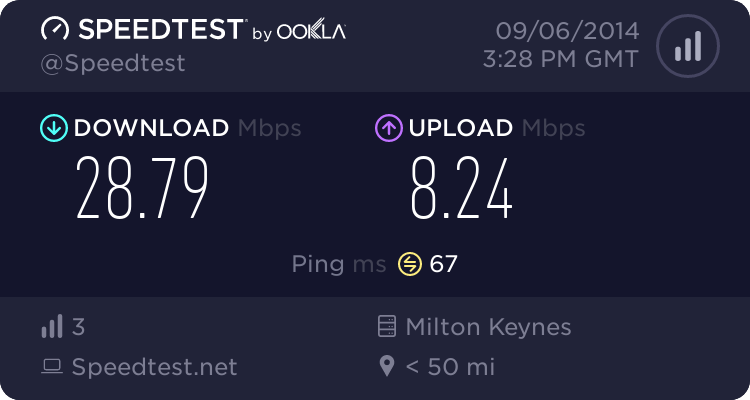 The BT infinity checker (Based on phone number) puts my line at 70.5/20Mbps and LBO's postcode checker puts it at 75.5/25Mbps I will be interested to what I can get though..
Quote: Following my email yesterday I have been able to speak with Digital Region again regarding your connection. I apologise for any confusion caused but it seems that we have been given some conflicting information, I can confirm that you are connected to the BNY008 cabinet, the line isn't aluminium and the line distance is in fact 367m from the cabinet (not 455m as previously advised) - I ensured that these figures were double checked. Out of interest, how is the connection currently performing? 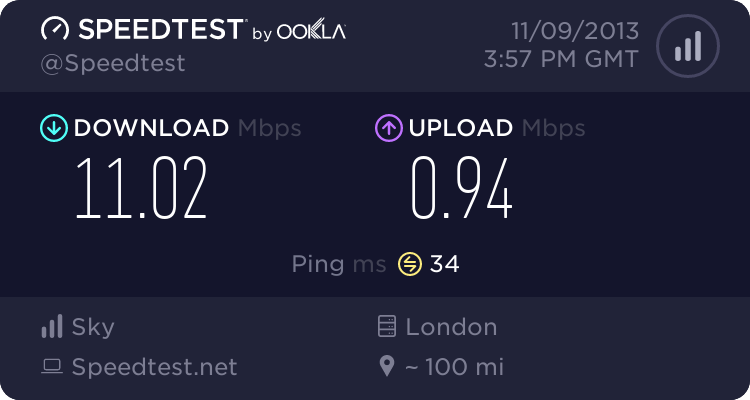 Digital Region mentioned that the line was looking very stable and was synced at a very high downstream and upstream speeds - you should currently be receiving very close to the 40Mb down and 10Mb up. Quote: Out of interest, how is the connection currently performing? 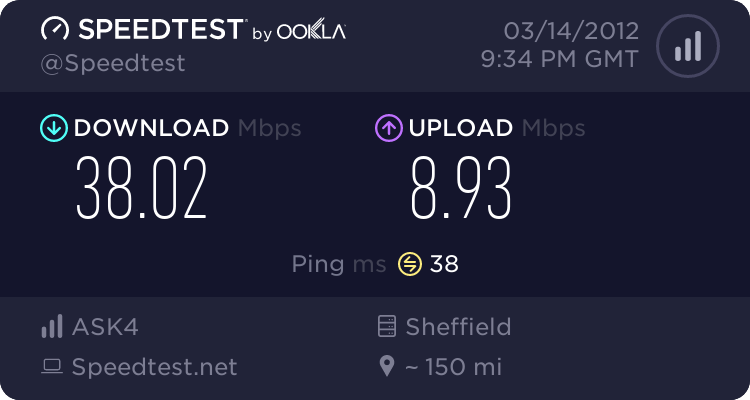 Digital Region mentioned that the line was looking very stable and was synced at a very high downstream and upstream speeds - you should currently be receiving very close to the 40Mb down and 10Mb up. How are you testing your speed? 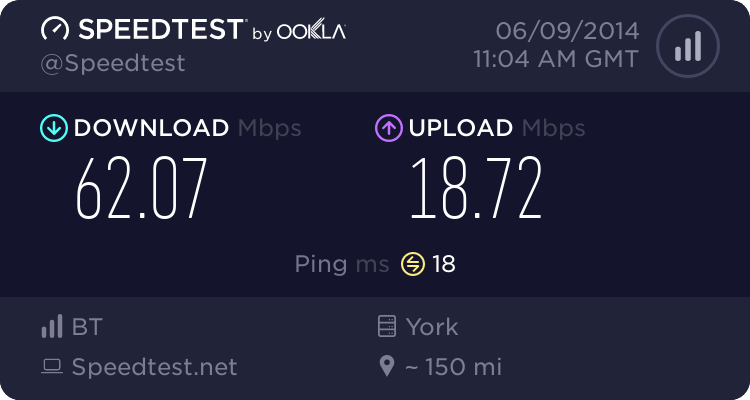 The best thing to do is test with simultaneous downloads from different sources as one source can't always handle 40Mbit, also I wouldn't rely on speed test servers for the same reason. I test my speeds regularly using different servers like Microsoft, MirrorService and others. Also, are you testing your speeds over wireless or cable? I test my speeds using JD Auto speed tester multi threaded download and upload. I also test on 2 different computers about half hour apart. My everyday laptop is on wireless that usually gets 38 down but had a peak of 39.1 and about 9.5 up peaking at 9.53. Also on a dedicated media server via Ethernet giving similar results just more stable speeds.